GetLinked® Software Forum • View topic - I am using the POSLink module for the Daily Summary. I can import and transfer and GetLinked recognizes the import and transfer, but I cannot find the journal entry anywhere on my drives to upload into my accounting software? Post subject: I am using the POSLink module for the Daily Summary. I can import and transfer and GetLinked recognizes the import and transfer, but I cannot find the journal entry anywhere on my drives to upload into my accounting software? This topic is for accounting systems that require a file to be imported (ex. Peachtree, MAS90, etc.). 2. Click on Setup > POSLink and select your location. 3. Click the "Transfer" tab for the accounting Transfer settings. 4. The path should be listed on the lower half of the Transfer window. In the screenshot below I'm saving the file to the folder Z:\temp\ using MAS90. It is the same for any system that is exporting to your computer. 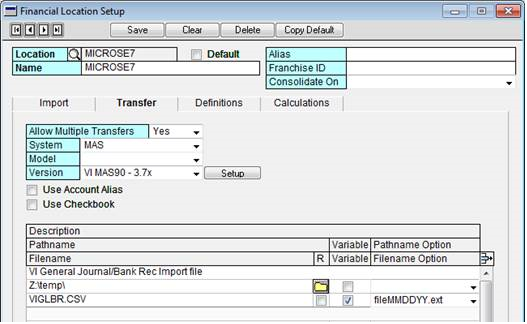 Some accounting systems do not need a file to be exported and GetLinked Software directly connects to those systems. If you need to change where the file is being saved you can click the little yellow folder button and browse to the new location. Then transfer the journal entry again and it should create a fresh .csv file for you. This same function works for all GetLinked Software modules: POSLink, PRLink, APLink, ARLink, GLLink and BRLink.